I’ve always been fascinated with what’s under the streets of London. From those first trips on the Underground to go shopping in London as a teenager, continued trips across the city to Wembley for concerts, a whole summer of commuting every day, then latterly business trips for conferences, and the odd pleasure trip, I’ve always liked the Underground, and what's around it. The history, the disused stations, the role during the wars, and of course the thought of everything else that’s down under the streets. IRA bomb scares (I was in one at Victoria station in 1991), tube strikes, lift closures (it’s a long way up the spiral staircases at Covent Garden), underground rivers, the Blackwall Tunnel (think I first went through that in the passenger seat of a 38 ton truck). There’s so much of interest. And there’s much more too. The forgotten Post Office railway, foot tunnels, Joseph Bazalgette’s vast complexes of sewers (as opposed to the sewage that his descendants have pumped through our TV screens) and Churchill’s bunkers. 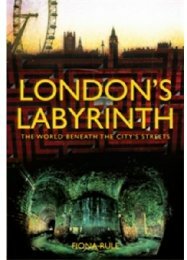 London's Labyrinth tells the story of an entire subterranean world where thousands and thousands of people have spent much of their lives. Fiona Rule has researched all of the different parts of subterranean London, and woven them into a history of life beneath the streets. If you thought that terrorist attacks started in the 1980s, not the 1880s, then this book will set you straight. There’s a tale of unrequited love from Charing Cross, where a young man shot his girlfriend, before turning the gun on himself. There are stories of knee tremblers, underground markets, robbery, pickpockets, and some of the most famous Tube disasters (going through King’s Cross still sends a shiver up the spine). This book is a must read for anyone who is interested in life under the streets of London, anyone who commutes across the city, and anyone with an interest in history. A great Xmas present and a fascinating read.